Florencia Villaggi, New York: Florencia specialises in international arbitration. She is a native Spanish-speaking practitioner from Latin America, trained in the Civil Law system but with extensive practice in a Common Law jurisdiction. Her experience encompasses commercial and investment arbitration, with focus on the Latin American region and the energy sector. Dan Waldek, Singapore: Daniel is a highly rated disputes lawyer specialising in construction, energy and infrastructure disputes covering projects across Asia Pacific. He is admitted as a solicitor in England and Wales and the BVI, and is a Recognised Foreign Lawyer with the Singapore International Commercial Court. Antony Crockett, Hong Kong: Antony has a significant regional and international market profile in business and human rights. He is qualified in Australia (Victoria), England and Wales, and Hong Kong SAR. He acts as an advocate in international arbitration proceedings and in arbitration-related court proceedings. Stella Hu, Beijing: Stella is a trilingual Mainland Chinese arbitration specialist with experience in complex cross-border disputes. She has strong client relationships with Chinese State-owned companies, private companies and financial institutions. The Singapore International Arbitration Centre (SIAC) has announced the release of its Investment Arbitration Rules (the Rules), which came into force on 1 January 2017. This release follows the earlier public consultation in February 2016, when practitioners were invited by SIAC to review and comment on the draft of the Rules. The Rules are the first of a kind. 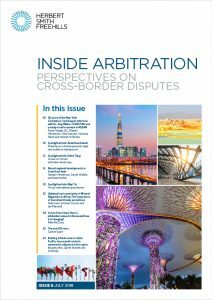 While private arbitral institutions often administer both commercial and investment arbitration, such as the ICC or the Stockholm Chamber of Commerce, SIAC is the first private institution to introduce a specific set of arbitration rules for investment arbitrations. In creating a dedicated set of rules, SIAC has adopted innovative approaches to address some of the key procedural issues commonly encountered in investment arbitration.